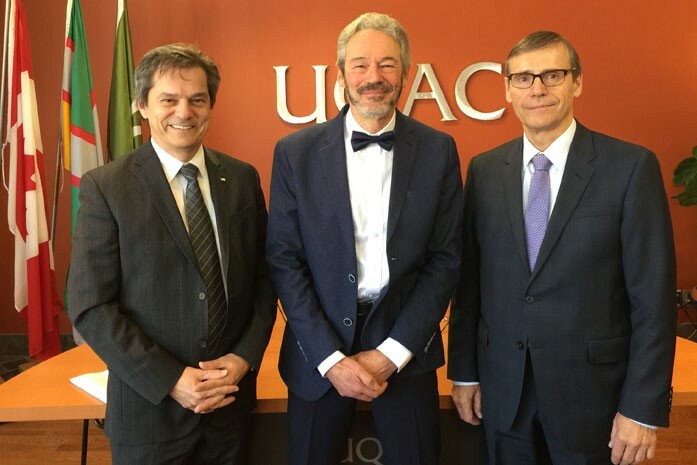 Resolute is donating $1 million over five years toward the creation of a prestigious industrial research Chair sponsored by the Natural Sciences and Engineering Research Council of Canada at the University of Quebec at Chicoutimi (UQAC). Our contribution, along with that of the Government of Quebec, the university and the university’s foundation, will support research into the boreal forest and the impact of changes in the landscape on black spruce growth in the context of climate change. A particular focus will be on the infestation of the spruce budworm that is currently presenting major challenges for the forest products industry. Resolute has enjoyed a rewarding and mutually beneficial collaboration with UQAC for 25 years. Through this partnership, we have gained a better understanding of the boreal forest and been able to modify our approaches in order to promote the sustainable development of the woodlands in our care. One of the best examples is the changes we have made to our harvesting practices due to research into the natural regeneration mechanisms of black spruce. The predictability of fiber supply is crucial for a company like ours, both in terms of quality and quantity. Not surprisingly, we are preoccupied with the significant impact the massive infestation of spruce budworm is having on the boreal forest and on woodlands that Resolute and many other companies rely on for the supply of fiber for our mills. The epidemic now affects some four million hectares, an area equivalent to the size of Switzerland. Managing the wood volumes affected by this epidemic represents a major challenge that is pivotal to the future viability of our operations on the North Shore and in the Saguenay–Lac-Saint-Jean regions of Quebec. We maintain that a better understanding of the impact of this epidemic on the future structure of the forests and on the quality of fiber is a prerequisite to confronting this challenge. The research of the UQAC Chair will include an unprecedented review of the history of past insect epidemics and their impacts on forest composition and structure, with a focus on the following three areas: 1) the relationship between spruce budworm outbreaks in the boreal and landscape variability; 2) the history and evolution of spruce budworm epidemics and their impacts on supply management and wood quality; and 3) the impacts of climate change on the growth and quality of black spruce stems. View the university’s press release here.